A Saturday night in KomPassion saw the roads outside packed bumper to bumper with cars, and the wooden tables pushed together for multiple birthday parties. Despite the locked door (a little offputting), service was brisk, friendly and the menu a compendium of temptation, brimming with porkiness. Pork satay or Vietnamese spring rolls with smoked duck or unagi mango salad canapé? Massaman curry cod or kimchi omelette with crab meat? There were only two of us dining but we wanted to try everything. 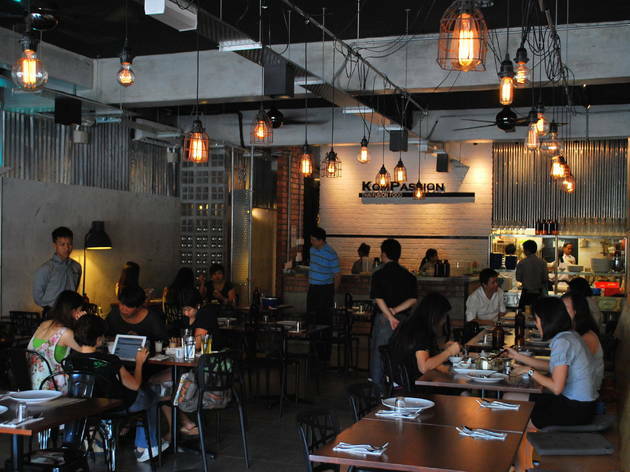 KomPassion, whose chef used to head My Elephant, is another suburban treasure, tucked away in the residential estate Damansara Kim. Parking is unpleasant, mainly thanks to the popularity of Restoran Golden Kim Wah at the corner, but plan ahead and come early, or venture into the housing roads behind the restaurant for some streetside parking. We started our meal with the aforementioned Vietnamese spring roll, which arrived looking like the results of a (stylish) fridge explosion. Chunks of smoked duck, julienned carrot, scallions, lettuce and coriander were wrapped in tender rice paper, topped with smatterings of crunchy pumpkin and sesame seeds and strewn with tiny clumps of roe and chunks of tomato. It was a lot to take in visually and texturally; taste-wise it was punchy and tangy, but the sheer volume of flavours and textures threatened to overwhelm the delicate smokiness of the duck. Next up was an excellent pucuk paku salad, the tender fern shoots tossed with sweet strips of young coconut, butterflied prawns and an abundance of zingy red onions. The freshness was especially prominent alongside the crunch of our next dish, small deep-fried shrimps (shells and all) tossed with curry leaves and kaffir lime leaves. For sheer anticipation though, neither could beat the king of the table: green curry with crispy roasted pork. The cubed chunks of roasted pork were crunchy and fragrant, doused in a heavy green curry sauce whose creaminess belied its kick. It’s about as far away from your standard green curry chicken as you can imagine – beneath the crunch, the pork had a tender silkiness to it you’d never get with chicken, and the sauce was aromatic, densely flavoured and deeply spicy. Delicious pork dishes, my favorite is Hang Laey Curry Pork! The Specials are indeed special and yummy. 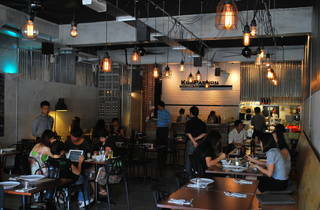 The sets are value for money too from RM13.90 incl drinks and side salad.